“What is Link”, you ask? Link is the very often requested feature of being able to link a registered user on your site to an entry in Connection and then allowing that user to edit their entry with or without it being moderated. Is there any setup involved? Link was designed to be plug and play requiring only minimal configuration which only takes a minute or two to complete. After installation and configuration your registered users will be able to add and edit their own entry in Connections with or without admin moderation. Fantastic! But I already setup entries in Connections for each of my users and I’ve been maintaining their entries. How do I link those? I’m glad you asked. Link has a feature called “link on login”. What this does do? When a user logs in, Link will search the entries in Connections for a matching email address. If one is found, Link will link that user to that entry and from that point on, that user will be able to edit that entry. Seamless integration with Form extension for frontend editing support. Tightly integrated with the Login extension. Easy to use shortcodes which can be used to put the View/Add and Edit Entry links on any page. Plug and play with minimal configuration. Full support for the Connections Custom Fields and Metabox API. NEW: Add bulk link user tool. NEW: Add bulk user unlink tool. NEW: Add entry link status. NEW: Add entry unlink action. NEW: Add option to link a WP User when adding/editing an entry. TWEAK: Setup a few core plugin properties. TWEAK: Utilize `cnText_Domain::register()` to load the translation files to remove code duplication. NEW: Add required filters to allow the Form shortcode to edit the current user\'s directory entry if one has been linked. OTHER: Link to plugin homepage should be https. DEV: Update plugin header to be consistent with other add ons. FEATURE: Add support for the User Switching plugin. Link on login will now also link on user switch. BUG: Remove extra slash from include path. BUG: Ensure the current logged in user does not trigger a 404 if their entry is in the moderation queue. BUG: Ensure url property exists in nave menu object before attempting to parse it. BUG: Correct method name call. NEW: Add support for the `home_id` and `force_home` options to the `` shortcode. TWEAK: Pass the `home_id` and `force_home` attributes when calling the Connections_Link::editURL() method. BUG: Do not set entry user to `0` when the add/edit form values do not exist. BUG: Correct bug that prevented the form input being added in some cases. OTHER: Correct version error in changelog.txt. I18N: Update Spanish translation MO/PO files. TWEAK: Pass the shortcode `$atts` to the `connections_link_action_edit_url` filter. TWEAK: Make the `cn_entry_action-edit` action higher priority so it runs before the Form extension. TWEAK: Add filter to prevent Form from rendering its edit entry action link. TWEAK: Pass the shortcode attributes thru the `connections_link_entry_action_edit_url` and `connections_link_edit_url` filters. BUG: Ensure the view URL is not FALSE before adding it in cnLoginWidgetLoggedInLinks(). FEATURE: Add shortcodes which output the View/Add and Edit links. FEATURE: The View/Add and Edit links can now be added to WordPress menus. FEATURE: Tightly integrate with the Login widget. TWEAK: Setup the current user entry object on the `init` hook and add a publicly callable method to access it. TWEAK: Refactor the code to separate the view/add/edit URLs into their own methods and refactor code to use these new methods. DEV: Fix minor code white and alignment. BUG: Fix bug which displayed the \"Add My Directory Entry\" link to users which did not have the correct capabilities assigned to their user role. TWEAK: Add fix for plugins which call the ` wp_login` action but do not pass the WP_User object like they should. I18N: Add Spanish (Spanish) translation. BUG: Fixed undefined index notice during AJAX requests. BUG: Add missing form ID so jQuery Validate runs on the form. BUG: Fix incorrect text domain. FEATURE: Improve responsive readiness of the admin form. BUG: Add page hook `profile_page_connections_link` to the valid Connections edit pages. FEATURE: Front-end editing of user linked entry when Form is installed an active. FEATURE: Action list item to \"View My Directory Entry\". FEATURE: Entry action to \"Add My Directory Entry\" or \"Edit My Directory Entry\". Link will resolve to the Link profile admin page unless Form is installed and active. 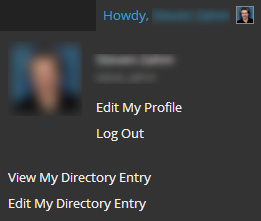 FEATURE: Add \"View My Directory Entry\" link to the admin bar. BUG: Check for DOING_AJAX to prevent PHP notices from potentially interfering with AJAX requests. TWEAK: Provide better backward compatibility with previous versions of Link. TWEAK: Users are no longer marked that they were checked. Now, the user will be checked on every login for a matching email address if the the user is not linked to a an entry. TWEAK: Increase link on login action priority so it runs before membership plugins redirect the user login. BUG: Add action to remove user ID from the Connections table when the user is deleted. BUG: Fixed scenario where entry data duplication may occur. BUG: Remove deprecated admin node menu item. BUG: Move admin bar init to the plugin init method because the edit my directory entry menu was not showing on the front end of the site.